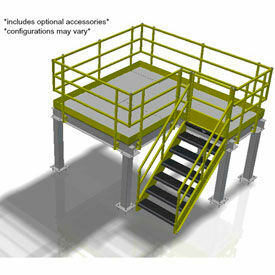 Equipto pre-fabricated mezzanines can help you create more floor space in a cost effective way. They are pre-fabricated so they are easy to install, move and add on to if your requirements change. Designed to integrate with other Equipto products to provide space saving that is custom tailored for your individual application. All decks offer 125 lbs./sq. ft. capacity. Galvanized Stairways With Rails Provide Safe And Convenient Access To All Levels In Commercial, Industrial Construction And Warehouses Environments. Stairways are made of galvanized steel for long lasting durability and corrosion resistance. Stairways are prefabricated for quick and easy assembly. Non-skid perforated galvanized steel grating provides additional safety. Used for temporary or permanent fixtures and indoor or outdoor applications. Types are BOCA, IBC and OSHA. Rise minimum and maximums range from 3’2"3/8" to 10'11" - 12"-2"." Overall widths range from 36" - 60". Tread widths available are 24", 30", 36" and 48". Run minimum and maximums vary per style. Swing gates allows easy and safe access to mezzanines using manual swing-action gates on each end. Gates swing up and down to provide a usable area of 58" W x 70" D x 76" H. Swing gates are balanced for ease of operation without use of springs. 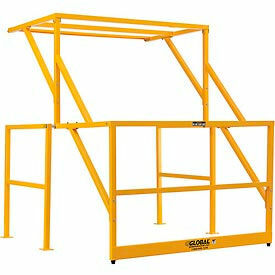 Mezzanine safety gate is made of heavy duty welded steel. 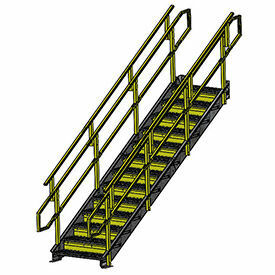 Mezzanine gate features 42" H handrail, 21" H mid-rail and 4" H kick plate for operator safety. Yellow powder coat finish for high visibility. Meets OSHA requirements. Platform Landings Add Valuable Area When Space Is Limited In Industrial, Commercial Or Construction Environments. Platform Landings are made of steel for long lasting durability. Platforms are economical, quickly installed and can be re-configured on premises as requirements change. Platforms are prefabricated to provide fast and easy assembly and double flooring capacity. No cutting or welding needed. Available widths are 48" and 96". Floor heights are 72", 96" and 120". Catwalks Provide Safe And Secure Access To Platforms In Industrial, Commercial Or Construction Environments. Catwalks are made of steel for long lasting durability. Units can be combines with stairways and ship stairs to create versatile structures. Prefabrication provides fast and easy assembly. 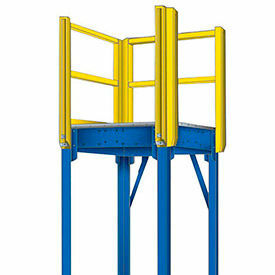 42" high safety railings and 4" high kick plates provide added safety and security. Lengths range 24"-240". Floor heights are 72", 96" and 120". Vertical clearance range 56"-108-3/4". Vestil Modular Steel Staircase Provides Instant Access To Mezzanines, Platforms And Walkways. Vestil Modular Steel Staircase features heavy steel construction for long lasting durability. Stairway ships unassembled to reduce freight costs and chance of shipping damage. Pre-engineered design allows for quick assembly. Steps and square tube handrail bolt directly to stringer, anchor plates stabilize staircase at top and base. Steps have a perforated tread for better traction and improved safety. Durable powder coat finish withstands abuse. Rugged staircases meet OSHA standards. Step quantity ranges from 10 to 18. Usable step width is 36". Step depth is 11-3/4". Heights are 72" to 132". Capacity is 1000 lbs. Stairway color is Blue. Handrail color is Yellow. Note: Each unit is custom built and requires a site-survey drawing before the order is processed. Then a final product drawings are required to have a customer signature of approval before production can begin. Since units are custom built, they are non-returnable. Ships Stair Cross Over Bridges Provide Safe, Multi-Level Access To Platforms When Space Is Limited In Industrial, Commercial Or Construction Environments. Ships Stair Cross Over Bridges are made of steel for long lasting durability. 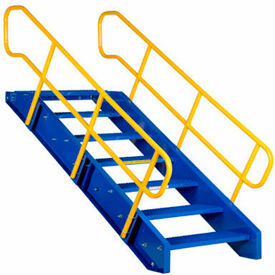 Extended hand rails and deep non-skid treads provide added safety. Ships Stars are prefabricated to provide fast and easy assembly. No cutting or welding needed. Lengths range 69"-113". Widths available are 29"and 35". Heights range 42"-123".Number of treads available are 4, 5, 6, 7, 8, 9, 10 and 11. 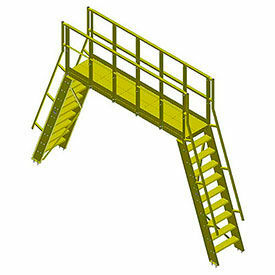 Equipto Galvanized Ships Stairs Are Used For Ships, Commercial or Industrial Construction or Warehouses. Equipto Ships Stairs are made of a sturdy galvanized steel for long lasting durability and cost one third the price of compatible stairs. These Stairs are prefabricated for quick and easy assembly. Non-skid perforated galvanized grating provide additional safety. Indoor or outdoor use; temporary or permanent. Available in 16 sizes with heights from 3'-8" 1o 11'-5" with two different tread widths of 24" and 30". Vestil Folding Mezzanine Ladders Are Used For Crowded Warehouses And Docks. 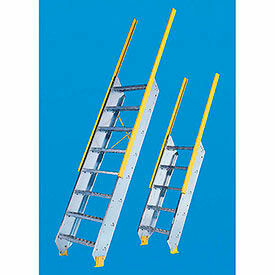 Vestil Folding Mezzanine Ladders feature all steel construction for long lasting durability. Ratcheted design quickly extends and retracts ladder. When retracted, ladder projects only 15-1/2" from mezzanine. 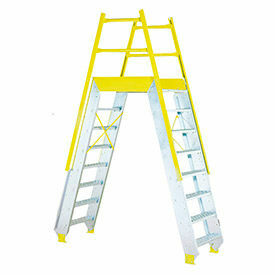 Ladder base includes wheels to ensure easy dependable movement. 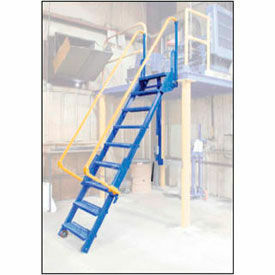 Handrails automatically raise and lock in place once ladder is fully extended to meet or exceed all OSHA requirements. When extended, 58° ladder incline is gradual and easy to use. Pre-engineered ladders ship unassembled to reduce freight costs and chance of shipping damage. Mounting bracket for bolted or welded attachment is included. All components are finished in durable powder coat to withstand abuse. Step quantities range from 5 to 10. Tread width is 24". Tread depth is 7". Ladder color is Blue. Handrail color is Yellow. Dimensions vary per model. Note: Customer must provide their mezzanine height at time of purchase. Bluff Mezzanines With Handrail & Kickplate. Bluff – mezzanines are made of steel for long lasting durability and dependability. Units provide an efficient and cost effective method of increasing storage, expanding office space and more. Subfloor underside features white finish for maximum brightness. 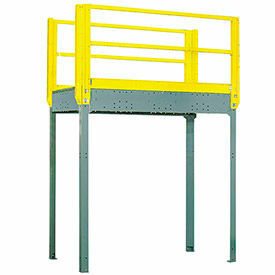 Includes additional handrail and kick plate with safety yellow powder coat finish. Package quantity is 1. Color is Gray. Dimensions vary per model. Bluff - Modular Cross Over Bridges Allow Personnel Mobility For Applications Including Industrial, Engineering, Manufacturing And More. Bluff - modular cross over bridges are made of steel for long lasting durability and dependability. Units allow stable and convenient personnel maneuverability reducing potential injury and enhancing workflow efficiency. Step quantities are 3, 4, 5, 6 and 7. Dimensions vary per model. 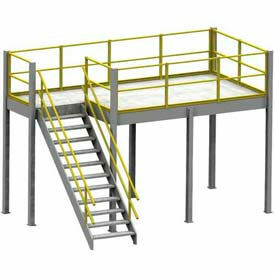 Bluff - IBC And OSHA Stairways Provide Customizable Height Access For Applications Including Industrial, Manufacturing, Engineering And More. 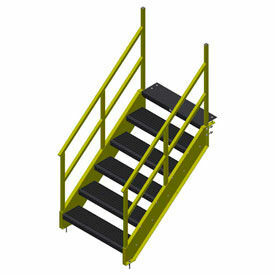 Bluff - IBC and OSHA stairways are made of steel for long lasting durability and dependability. Units feature bar grate or diamond plate tread options for operator stability. Includes two stringers with welded handrail, grip rail and treads bolted between stringers. Designed to meet exact height and space requirements. Step quantities range from 4 to 21. Meets IBC, UBC and OSHA requirements. Dimensions vary per model.